The fourth annual remembering Mike Kitchen and Heidi Pratt ride is scheduled for Saturday, Sept. 8. Registration opens at 8 a.m. at the Oakfield Community Center. 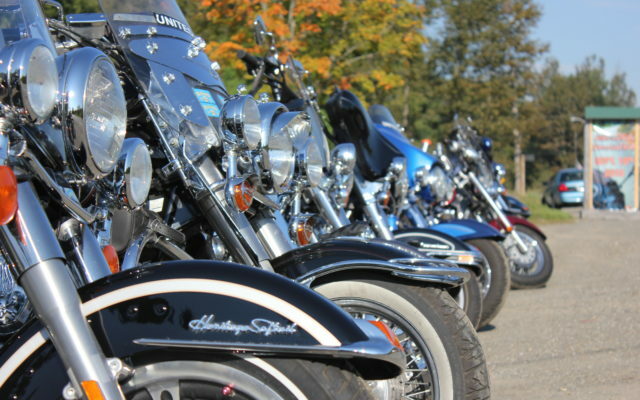 OAKFIELD, Maine — The fourth annual remembering Mike Kitchen and Heidi Pratt ride is scheduled for Saturday, Sept. 8. Registration opens at 8 a.m. at the Oakfield Community Center. A safety briefing and presentations will be held at 10 a.m. The ride is scheduled to begin at 10:30 a.m. and those not riding, but wishing to walk to Mike and Heidi’s house lot will do so immediately thereafter. There is no registration fee. Participants can purchase a wrist band for $10 which also gives them a meal following the ride. Several vintage automobiles from North Country Cruisers, as well as private individuals, are planning to participate. Automobiles will travel in the opposite direction as the motorcyclists, meeting approximately half way. Motorcyclists will travel Route 212 to Route 11, then through Mount Chase, Patten, Island Falls and back to Oakfield. The ride is expected to last approximately 60 minutes. Some motorcyclists as well as vintage car owners may invite participants to join them, as happened during past years. Upon returning to the Oakfield Community Center, participants can enjoy a hot meal of Italian sausage, salads and deserts. An auction will be held at 1:30 p.m. as well as drawing of raffle tickets toward prize baskets. This year’s event marks the fifth anniversary of Kitchen and Pratt’s deaths. The couple were murdered in their home in 2013. An event was not held in 2016, at the request of the District Attorney’s Office. The initial planning committee has formed a non-profit organization, “Mike and Heidi Community Fund.” The organization recently received recognition from the Internal Revenue Service as a Public Charity under section 501(c )(3). Proceeds from this event will go into that fund. This fund is administered by a board of directors. Board members include Heidi Pratt’s son, Paul Suiter of Portland as well as her sister Brenda Hersey of Oakfield. Additional board members are Joe and Becky McLaughlin of Limestone, Torri Bates of Smyrna, Jerri Russell and Shannon Lloyd of Oakfield and Ken and Pearl Bustard of Bucksport. Recently joining the board is Jill Bustard of Merrill. The board recently formed a scholarship committee, chaired by Heidi’s son Paul Suiter. They will be distributing applications for both traditional and non traditional scholarships. Plans are underway for a “Mike and Heidi Community Christmas” to be held at Oakfield Community Center on Saturday, Dec. 8. Numerous individuals and businesses have supported this year’s event with monetary donations and sponsorship of raffle baskets. New and exciting items for this year’s auction includes two nights at a Canadian lodge to include a Ruffed Grouse hunt in addition to an airplane ride for two. Anyone wishing more information or wanting to volunteer can contact Ken Bustard at 659-2018 or accountingcoach@gmail.com. Shannon Lloyd of Oakfield is also a contact person at 267-0480. The “Mike and Heidi Ride 2018” facebook page is another way to make contact or get more information about the event.